Dubbed "America's Stonehenge", this granite monument in Georgia appeals to all sorts of conspiracy theorists. Most of those are pretty harmless, and in fact a lot of people would probably agree that many of them are fine ideas. But the first three, recommending population control, eugenics, and a single world language, throw fuel on the fire of conspiracy theorists who fear an impending New World Order. If not for these first three controversial guides, the stones would probably be long forgotten. The story of how the Guidestones came to be is just as mysterious as their meaning. The short version of it goes like this. A gentleman named Joe H. Fendley, Sr., was the president of one of the region's many granite companies, the Elberton Granite Finishing Company. According to the story, one day in June, 1979, he received a visit from a well dressed man who identified himself only with the pseudonym of Robert C. Christian. He told Fendley he represented "A small group of loyal Americans who believe in God." Christian showed Fendley the plans for his monument and asked for a price. Interestingly, Christian gave his specifications using the metric system, which was pretty rare in the United States in 1979. Fendley later said the price he gave was "six figures". Christian inquired where Fendley banked, and then left to go meet with the banker. Thirty minutes later, Christian was received by Wyatt C. Martin, the president of the Granite City Bank. Christian expressed the need for secrecy on this project, including that the funds would be transferred to Martin from a number of different banks around the country. As a banker, Martin did require that Christian show him his true identification, which Christian did, only after Martin agreed to absolute secrecy in perpetuity. Martin agreed to be Christian's representative in managing the project going forward. Christian then left, corresponding only with Martin from that moment on, and often from different cities. Fendley's company went to work. On Christian's behalf, Martin purchased fives acres of land atop the highest hill in the county for $5000 from farmer Wayne Mullenix, who subsequently acted as contractor laying the foundation for the monument. The six granite slabs were cut, drilled, lettered, and positioned according to the specifications, and unveiled on March 22, 1980. About 400 curious onlookers attended the opening. In the decades since, the Georgia Guidestones have sat on their hilltop, gradually succumbing to vandalism, although a number of local volunteers have tried to keep them maintained. Other supporters have offered to install benches or pathways. Local churches are said to disapprove, but since the Guidestones have proven to be the most significant tourist attraction in Elberton, the town lets them be. The Sheriff has even installed security cameras to keep an eye on them. The biggest question that everyone wants to know about the Guidestones is who built them? The stones themselves give one answer. 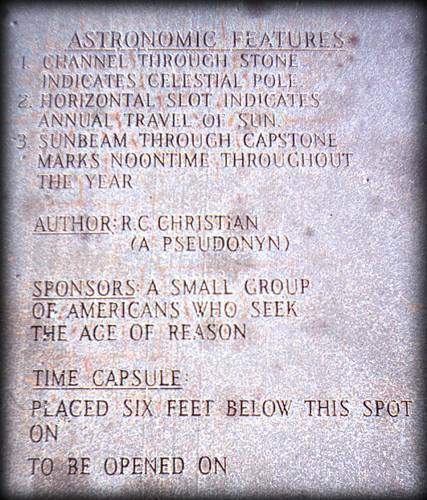 A flat stone in the ground gives some information about the monument, and lists as its sponsors "A small group of Americans who seek the age of reason." This answer, quite obviously, is unsatisfactory to the curious. According to Christian, this was by design: he once said "The group feels by having our identity remain secret, it will not distract from the monument and its meaning." I happen to think he was right on the money. If the monument was known to have been erected by a particular group, it would be easy to dismiss it as "Oh, just more of that nonsense from so-and-so." The lack of a source lets the Guidestones stand on their own, and the mystery keeps people interested. The nomination of candidates is easily started. The most obvious name is that of Robert C. Christian himself: Was he actually the only person involved? Although Christian and Martin, the banker, corresponded quite regularly through the years and occasionally even met for dinner, Martin now says that he has not heard from him for some time and assumes he has passed away. Christian said he chose that particular pseudonym because he was a Christian. Some, most notably the conspiracy theorist Jay Weidner, have pointed out the similarities between the name R. C. Christian and that of the apocryphal founder of Rosicrucianism, Christian Rosenkreuz. But whoever Christian was, he was probably not an official representative of Rosicrucianism. Rosicrucian philosophies and mysticism are well documented and widely available, and they bear only minimal similarity to the Guiding Thoughts. L. Ron Hubbard has also been suggested as Christian's true identity, but this is an even worse fit. Martin and Fendley are indeed both real people, which is something that you do need to check out in stories like this. The late Mr. Fendley served as mayor of Elberton from 1980 through 1987; and Wyatt Martin is still alive, in fact Wired Magazine interviewed him in 2009. Could either Martin or Fendley have been the real sponsor, or even colluded as co-sponsors and made up the alleged R. C. Christian? It's a possibility. Nobody else ever saw or spoke with Christian. Martin showed Wired's reporter a box of his correspondence with Christian, but would not allow the papers to be examined, citing his promise of secrecy. It's often noted that Fendley was a 32nd-degree Freemason, and several of his top workers who participated in the Guidestones were also Freemasons in his same lodge. While this may be intriguing to conspiracy theorists, it is not useful evidence of anything at all. Since the Georgia Guidestones were a private enterprise, there are no public records of its financing trail, except the property purchase, which has been fully disclosed. Thus, if Martin and Fendley were indeed responsible, there is no evidence for it, and little likelihood of any evidence ever coming to light. There is, in fact, no reason that I could find to doubt the story as they've told it. The best argument I can think of to point the finger at Martin and Fendley is that they lived in Elberton, near the monument; and Elberton is an awfully strange place to erect a monument that you want to be seen by the whole world. Martin and Fendley, if they wanted to build such a monument, might well choose to do it locally. However, you could make this same argument wherever in the world the monument was built, citing whoever contracted its construction. This small fact is an inevitability of the circumstance, it's not evidence; and does not suggest Martin and Fendley as the sponsors. Conspiracy theorists also point to the name of the type of granite used: Pyramid Blue. Clearly (to some), the pyramid imagery suggests Masonic motives. In fact, the name comes from the name of the quarry, Pyramid Quarries, Inc., also in Elberton. Why was this quarry chosen? Simply because Fendley happened to own it. And he didn't even name it: He purchased the company in the 1970's as a supplier for his granite finishing and pet memorial companies. There's one more clue in the Georgia Guidestones that points conspiracy theorists to suspect an origin in some Zionist New World Order, and that's the eight languages in which the Guiding Thoughts are inscribed. You might expect the eight most common languages to have been used. You would be in error. The languages are English, Spanish, Swahili, Hindi, Hebrew, Arabic, Mandarin, and Russian. Missing from the top eight are Bengali, Portuguese, Japanese, and German. Why are Hebrew and Swahili included? They're not even in the world's top fifty languages. Even if you're only considering languages spoken in the United States, the top eight are still missing Cantonese, French, German, Tagalog, Vietnamese, and Italian. I'm not sure what the inclusion of Swahili tells us, but the inclusion of Hebrew suggests to conspiracy theorists that a Zionist New World Order is responsible for the Guidestones. This, of course, presumes the existence of a Zionist New World Order conspiracy, and it presumes that such a conspiracy would be usefully served by the erection of a random granite monument in the middle of nowhere in Georgia. Both presumptions strain credibility. I dispelled my own hypothesis that the true sponsor was merely a fan of 2001: A Space Odyssey with a quick calculation showing the main stones' proportions as 1×4×10, just off from Clarke's squares of 1, 2, and 3. The facts of the Guidestones' history and construction is publicly available in great detail, in a 50-page book published by the Elberton Granite Finishing Company, called The Georgia Guidestones. It includes biographies of many of the principal workers and characters in the story, and dozens of photographs of the monument and its construction process. Anything you want to know about the Guidestones can be found in this book. Is the publication of this book evidence that Fendley was behind the whole thing? Not really, because there is another explanation that does not require such an assumption. The Guidestones were the most expensive project Fendley ever did, and by far the most famous. As such, they were the best possible advertisement for his company. What business would not leverage such a marketing opportunity? So, again, Fendley's promotion of the Guidestones were merely an inevitability of the circumstance. In a world with free speech, there are going to be Georgia Guidestones, and all manner of similar exhibits. If you don't expect to find them outside of the existence of a New World Order conspiracy, you are being unrealistic. There's no proof that the Guidestones are not evidence of a conspiracy, but they're also exactly consistent with what we'd expect to find without such a conspiracy. Bridges, B. The Georgia Guidestones. Elberton: Elberton Granite Finishing Company, Inc., 1980. Lewis, M. Paul (ed). Ethnologue: Languages of the World, Sixteenth Edition. Dallas: SIL International, 2009. May, L. "In one small town, the human condition is etched in stone." Los Angeles Times. 4 Sep. 1989, Volume 108. Schemmel, W. Insiders' Guide Off the Beaten Path Georgia. New York: Globe Pequot, 2006. 205-206. Sullivan, R. "American Stonehenge: Monumental Instructions for the Post-Apocalypse." Wired. 20 Apr. 2009, Volume 17, Number 5.